The overwhelming amount of unstructured text data available today from traditional media sources as well as newer ones, like social media, provides a rich source of information if the data can be structured. Named Entity Extraction forms a core subtask to build knowledge from semi-structured and unstructured text sources. Some of the first researchers working to extract information from unstructured texts recognized the importance of “units of information” like names (such as person, organization, and location names) and numeric expressions (such as time, date, money, and percent expressions). They coined the term “Named Entity” in 1996 to represent these. Considering recent increases in computing power and decreases in the costs of data storage, data scientists and developers can build large knowledge bases that contain millions of entities and hundreds of millions of facts about them. These knowledge bases are key contributors to intelligent computer behavior. Not surprisingly, Named Entity Extraction operates at the core of several popular technologies such as smart assistants (Siri, Google Now), machine reading, and deep interpretation of natural language. This post explores how to perform Named Entity Extraction, formally known as “Named Entity Recognition and Classification (NERC). In addition, the article surveys open-source NERC tools that work with Python and compares the results obtained using them against hand-labeled data. The information extraction concepts and tools in this article constitute a first step in the overall process of structuring unstructured data. They can be used to perform more complex natural language processing to derive unique insights from large collections of unstructured data. In order to follow along with the work in this article, we recommend using Anaconda, which is an easy-to-install, free, enterprise-ready Python distribution for data analytics, processing, and scientific computing. With a few lines of code, you can have all the dependencies used in this post with, the exception of one function (email extractor). Follow the Use Environment from File instructions on Anaconda's website. If you use an alternative method to set up a virtual environment, make sure you have all the files installed from the yml file. The one dependency not in the yml file is the email extractor. Cut and paste the function from this Gist, save it to a .py file, and make sure it is in your sys.path or environment path. The proceedings from the Knowledge Discovery and Data Mining (KDD) conferences in New York City (2014) and Sydney, Australia (2015) serve as our source of unstructured text and contain over 200 peer reviewed journal articles and keynote speaker abstracts on data mining, knowledge discovery, big data, data science, and their applications. The full conference proceedings can be purchased for $60 at the Association for Computing Machinery's Digital Library (includes ACM membership). This post will work on a data set that is equivalent to the combined conference proceedings, but only use abstracts and extracts from the text, rather than the full proceedings, a data set that can be found on the ACM website. We will explore reading PDF data and discuss follow-on analytics if the full proceedings are available to you. Visual inspection reveals that the target filenames begin with a “p” and end with “pdf.” As a first step, we determine the number of files and the naming conventions by using a loop to iterate over the files in the directory and printing out the filenames. Each filename also gets saved to a list, and the length of the list tells us the total number of files in the dataset. Returns a filtered list of paths to PDF files representing our corpus. A total of 253 files exist in the directory. Opening one of these reveals that our data is in PDF format and that it is semi-structured (follows journal article format with separate sections for "abstract" and "title"). While PDFs provide an easily readable presentation of data, they are extremely difficult to work with in data analysis. In your work, if you have an option to get to data before conversion to a PDF format, be sure to take that option. Pdfminer - contains a command line tool called “pdf2txt.py” that extracts text contents from a PDF file (you can visit the pdfminer homepage for download instructions). Subprocess - a standard library module that allows us to invoke the “pdf2txt.py” command line tool within our code. NLTK - the Natural Language Tool Kit, or NLTK, serves as one of Python’s leading platforms to analyze natural language data. String - provides variable substitutions and value formatting to strip non-printable characters from the output of the text extracted from our journal article PDFs. Unicodedata - allows Latin Unicode characters to degrade gracefully into ASCII. This is an important feature because some Unicode characters won’t extract nicely. Our task begins by iterating over the files in the directory with names that begin with "p" and end with "pdf." This time, however, we will strip the text from the pdf file, write the .txt file to a newly created directory, and use the fname variable to name the files we write to disk. Keep in mind that this task may take a few minutes depending on the processing power of your computer. ## Create a path to extract the corpus. Extracts a text corpus from the PDF documents and writes them to disk. # Create corpus directory if it doesn't exist. # For each PDF path, use pdf2txt to extract the text file. fname = os.path.splitext(os.path.basename(path)) + ".txt"
Next, we build a custom NLTK corpus. Having our target documents loaded as an NLTK corpus brings the power of NLTK to our analysis goals. # Create an NLTK corpus reader to access text data on disk. We now have a semi-structured dataset in a format that we can query and analyze. First, let's see how many words (including stop words) we have in our entire corpus and the vocabulary of the corpus. The NLTK book has an excellent section on processing raw text and unicode issues. It provides a helpful discussion of some problems you may encounter. To begin our exploration of regular expressions (a.k.a. "regex"), it's important to point out some good resources for those new to the topic. An excellent resource may be found in Johns Hopkins University's Coursera video titled Getting and Cleaning Data. As a simple example, let’s extract titles from the first 10 documents. Use a regular expression to extract the titles from the corpus. # If we find one, yield the space joined groups. This code extracts the titles, but some author names get caught up in the extraction as well. For simplicity, let's focus on wrangling the data to use the NERC tools on two sections of the paper: the “top” section and the “references” section. The “top” section includes the names of authors and schools. This section represents all of the text above the article’s abstract. The “references” section appears at the end of the article. The regex tools of choice to extract sections are the positive lookbehind and positive lookahead expressions. Using these, we will build two functions designed to extract the “top” and “references” sections of each document. In addition to extracting the relevant sections of the documents, our two functions will obtain a character count for each section, extract emails, count the number of references and store that value, calculate a word per reference count, and store all the above data as a nested dictionary with filenames as the key. - "ref": the references and anything that follows. Yields the text as top, ref respectively. # Iterate through all text for each file id. of references, as well as a "words per reference" count. Pass either a specific document id, a list of ids, or None for all ids. The above code also makes use of the nltk.word_tokenize tool to create the "word per reference" statistic (takes time to run). I want to take an opportunity here to say few words about the data. When working with natural language, one should always be prepared to deal with irregularities in the data set. This corpus is no exception. It comes from a top-notch data mining organization, but human error and a lack of standardization makes its way into the picture. For example, in one paper the header section is entitled “Categories and Subject Descriptors,” while in another the title is “Categories & Subject Descriptors.” While that may seem like a small difference, these types of differences cause significant problems. There are also some documents that will be missing sections altogether, i.e. keynote speaker documents do not contain a “references” section. When encountering similar issues in your work, you must decide whether to account for these differences or ignore them. I worked to include as much of the 253-document corpus as possible. Next, let's test the “references” extraction function and look at the output by obtaining the first 10 entries of the dictionary created by the function. This dictionary holds all the extracted data and various calculations. The tabulate module is a great tool to visualize descriptive outputs in table format. As you can see, this is a good start to performing bibliographic analysis with Python. Now that we have a method to obtain the corpus from the “top” and “references” sections of each article in the dataset, we are ready to perform the named entity extractions. In this post, we examine three popular, open source NERC tools. The tools are NLTK, Stanford NER, and Polyglot. A brief description of each follows. NLTK has a chunk package that uses NLTK’s recommended named entity chunker to chunk the given list of tagged tokens. A string is tokenized and tagged with parts of speech (POS) tags. The NLTK chunker then identifies non-overlapping groups and assigns them to an entity class. You can read more about NLTK's chunking capabilities in the NLTK book. Stanford's Named Entity Recognizer, often called Stanford NER, is a Java implementation of linear chain Conditional Random Field (CRF) sequence models functioning as a Named Entity Recognizer. Named Entity Recognition (NER) labels sequences of words in a text that are the names of things, such as person and company names, or gene and protein names. NLTK contains an interface to Stanford NER written by Nitin Madnani. Details for using the Stanford NER tool are on the NLTK page and the required jar files can be downloaded here. Polyglot is a natural language pipeline that supports massive multilingual (i.e. language) applications. It supports tokenization in 165 languages, language detection in 196 languages, named entity recognition in 40 languages, part of speech tagging in 16 languages, sentiment analysis in 136 languages, word embeddings in 137 languages, morphological analysis in 135 languages, and transliteration in 69 languages. It is a powerhouse tool for natural language processing. We will use the named entity recognition feature for English language in this exercise. Polyglot is available via pypi. We can now test how well these open source NERC tools extract entities from the “top” and “reference” sections of our corpus. For two documents, I hand labeled authors, organizations, and locations from the “top” section of the article and the list of all authors from the “references” section. I also created a combined list of the authors, joining the lists from the “top” and “references” sections. Hand labeling is a time consuming and tedious process. For just the two documents, this involved 295 cut-and-pastes of names or organizations. For each NERC tool, I created functions to extract entities and return classes of objects in different lists. Extract entities using the Stanford NER tagger. Extract entities using the NLTK named entity chunker. In this next block of code, we will apply the NLTK standard chunker, Stanford Named Entity Recognizer, and Polyglot extractor to our corpus. We pass our data, the “top” and “references” section of the two documents of interest, into the functions created with each NERC tool and build a nested dictionary of the extracted entities—author names, locations, and organization names. This code may take a bit of time to run (30 secs to a minute). # Only extract our annotated files. We will focus specifically on the "persons" entity extractions from the “top” section of the documents to estimate performance. However, a similar exercise is possible with the extractions of “organizations” entity extractions or “locations” entity extractions too, as well as from the “references” section. The above dataframe illustrates the mixed results from the NERC tools. NLTK Standard NERC appears to have extracted 3 false positives while the Stanford NER missed 2 true positives and the Polyglot NERC extracted all but one true positive (partially extracted; returned first name only). Here is a quick figure summarizing overall model performance. 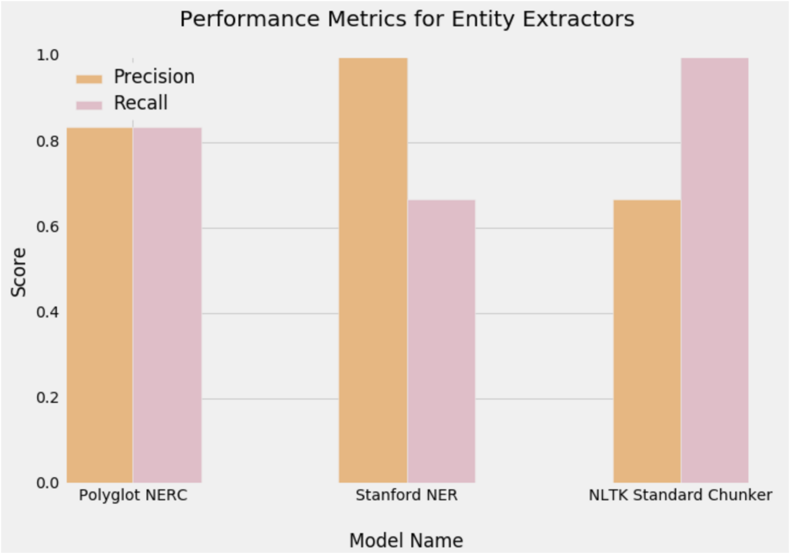 str1 = "NLTK Standard NERC Tool Metrics"
str2 = "Stanford NERC Tool Metrics"
str3 = "Polyglot NERC Tool Metrics"
The Stanford NER tool is very precise (specificity vs sensitivity). The entities it extracts were 100% accurate, but it failed to identify half of the true entities. The Stanford NER tool would be best used when a data scientist wanted to extract only those entities that have a high likelihood of being named entities, suggesting an unconscious acceptance of leaving behind some information. The Polyglot Named Entity Recognizer identified five named entities exactly, but only partially identified the sixth (first name returned only). The data scientist looking for a balance between sensitivity and specificity would likely use Polyglot, as it will balance extracting the 100% accurate entities and those which may not necessarily be a named entity. In our discussion above, we notice the varying levels of performance by the different NERC tools. Using the idea that combining the outputs from various classifiers in an ensemble method can improve the reliability of classifications, we can improve the performance of our named entity extractor tools by creating an ensemble classifier. Each NERC tool had at least 3 named persons that were true positives, but no two NERC tools had the same false positive or false negative. Our ensemble classifier voting rule is very simple: Return all named entities that exist in at least two of the true positive named entity result sets from our NERC tools. We implement this rule using the set module. We first do an intersection operation of the NERC results vs the hand labeled entities to get our "true positive" set. To get a visual comparison of the extractions for each tool and the ensemble set side by side, we return to our dataframe from earlier. In this case, we use the concat operation in pandas to append the new ensemble set to the dataframe. First, a quick visual to see how performance improved. str = "Ensemble NERC Metrics"
Exactly as expected, we see improved performance across all performance metric scores and, in the end, get a perfect extraction of all named persons from this document. Before we go any further, the idea of moving from "okay" to "perfect" is unrealistic. Moreover, this is a very small sample and only intended to show the application of an ensemble method. Applying this method to other sections of the journal articles will not lead to a perfect extraction, but it will indeed improve the performance of the extraction considerably. Let's take our list of persons from the ensemble results, store it as a Python dictionary, and then convert it to JSON. Alternatively, we could use the dumps function from the json module to return dictionaries, and ensure we get the open file format at every step. This way, other data scientists or users could pick and choose what portions of code to use in their projects. In this post, we've covered the entire data science pipeline in a natural language processing job that compared the performance of three different NERC tools. A core task in this pipeline involved ingesting plaintext into an NLTK corpus so that we could easily retrieve and manipulate the corpus. Then we used the results from the various NERC tools to create a simplistic ensemble classifier that improved the overall performance. The techniques in this post can be applied to other domains, larger datasets or any other corpus. Everything I used in this post (with the exception of the Regular expression resource from Coursera) was not taught in a classroom or structured learning environment. It all came from online resources, posts from others, and books (that includes learning how to code in Python). If you have the motivation, you can do it. Learning how to properly extract unstructured text data can improve your businesses analytics. Schedule a free consultation to find out how we can help!